Bavaria is probably the most beautiful state in Germany – full of historic sights, cute towns and villages, bustling cities, and great scenery. Coming from the northern part of Germany (Bremen), I hate to say it, but, yes, Bavaria is the prettiest state here. Located all the way down in the south of Germany, bordering Austria, it isn’t a place where I would just visit regularly. However, after I had already visited places like Munich, Nurnberg, and Rothenburg ob der Tauber, I decided it was time to road trip Bavaria. And, yes, this part of Germany is picturesque. 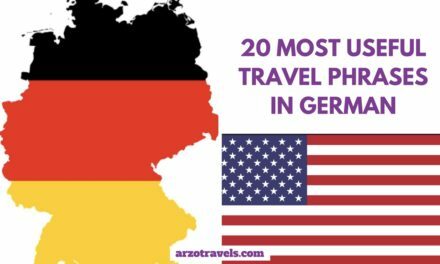 Given its size (it is the biggest state in Germany), I do not even claim to have seen all the top places in Bavaria, but I have gotten around and here are my tips for the most beautiful places in Bavaria, and some travel tips for your trip. Car or public transportation? Here are my tips. Driving in Bavaria is a good way to get around. There are no tolls for cars in Germany, the streets are well-paved and safe, and people drive well (just a little side blow to Italian drivers). There are motorway streets without speed limits, but most streets do have a speed limit you should stick to (speed cams are spread throughout the country). A parking disc might be useful in some places (I needed it in Dinkelsbühl, for instance). Petrol in Bavaria is quite expensive. Diesel costs about 1.40€ and petrol (gasoline) is about 1.50€ (per liter). This is just an average as prices vary greatly. In the morning and afternoon/evening, prices are highest, and during the day, prices decrease. Parking can be tricky in tourist areas and is also pricey (a day ticket for Neuschwanstein Castle is 6.50€, for example, but in cities like Munich, it is way more expensive). Most petrol stations (actually, all) are self-service and you can pay cash or with a credit card at the cashier. In smaller villages, there might be machines you have to pay directly. Getting around via trains and buses is actually quite easy. While the Deutsche Bahn is not really my favorite company to travel with, they get you from one place to the other. Not cheap and often not on time, but well, we cannot have it all. If you are in Bavaria, you can buy daily tickets and use them for all of the trains and buses in Bavaria. If you get “Bayern Tickets,“ it is actually not expensive (about 25€ for one person, each additional person (max. 5 people) cost 3-5€ extra and it saves you the headache of finding parking spaces. Tip: Buy your ticket from the ticket machine to avoid paying fees. I never suggest visiting a place in Europe in the summer. Every place is full, and especially in Bavaria, which is extremely popular among people from all over the world, it is crowded. 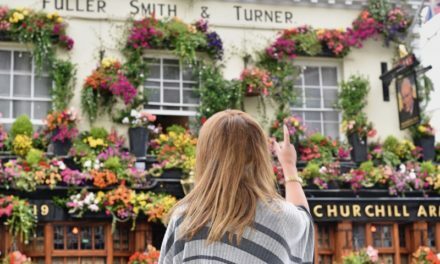 Since we cannot rely on seasons and how the weather is supposed to be at a certain time, I would advise visiting from September to October, or from April to June. If you are into Christmas and winter activities, then Bavaria is also great to visit in the winter. Given its mountains, it is a popular skiing destination. Prices in Bavaria for accommodations, fuel, or food are generally higher than in the rest of Germany. 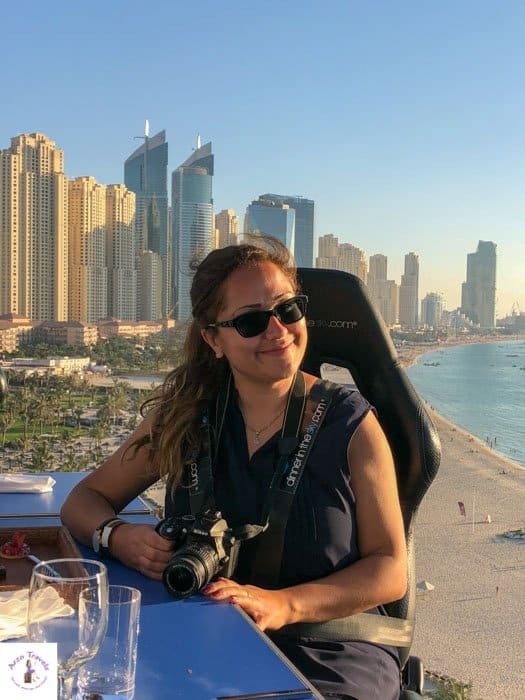 Munich and main tourist spots tend to be more expensive – you can have a quick lunch in a regular restaurant for about 10€ – of course, prices vary strongly and you can find much cheaper but also more luxurious restaurants. Entry to castles like (Neuschwanstein Castle is about 13€ per person). Compared to Austria or Switzerland though, it is cheaper and you will get good value for your money. I visited Bavaria several times – and normally Munich was my base to get around. However, this time I road tripped Bavaria for about two weeks and stayed at a place for max. 5 nights. E.g. if you stay in Munich you can do a lot of day trips. 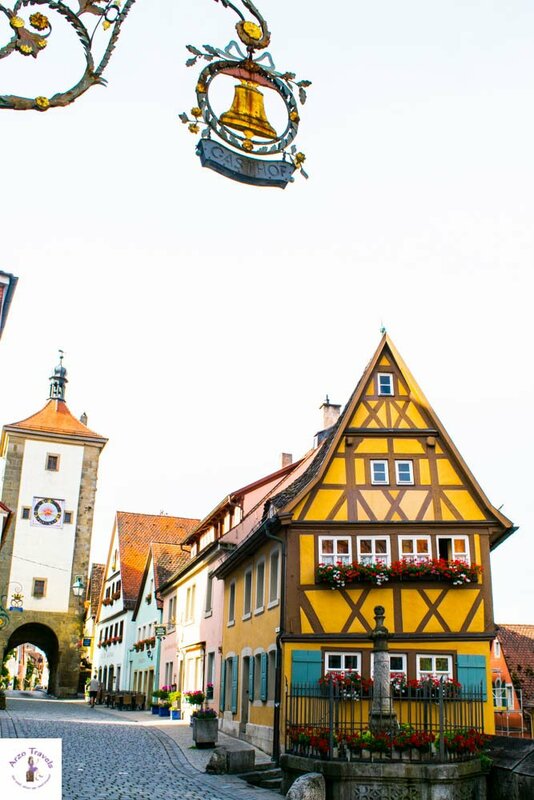 But if you drive and don’t mind changing hotels, I recommend to stay in the area of Rothenburg ob der Tauber (and visit Wurzburg etc. from there), then Garmisch-Partenkirchen is a great base because you can visit places like Eibsee, Zugspitze and Breitbachklamm. Berchtesgaden is a good base if you want to explore places like Königssee, Salzburg. For each tourist spot, I will name a few great places to stay – if you are want to get a general overview of hotels in Bavaria- click here. There are different dialects in Bavaria, and though everyone understands High German, not everyone speaks it perfectly. However, as someone who doesn’t understand any Bavarian dialect, I had no issues and people tried to adjust. Basic English is spoken in all touristy areas. Bavaria´s crime rate is quite low. Just keep your eyes open and exercise common sense and you should be fine. 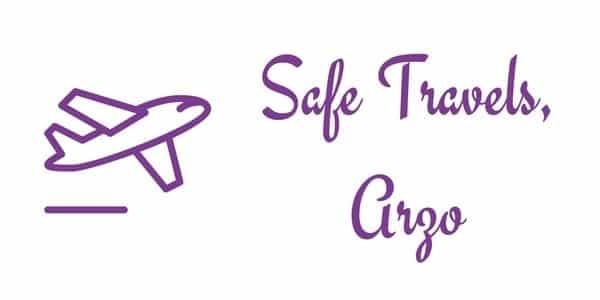 Especially in tourist areas, it is recommended to keep your belongings and your wallet close to you. If you get around by car, don’t leave valuables on display. Do you love healthy food? Maybe even vegetarian or vegan food? Then I have bad news for you. Bavaria doesn’t make it easy for people who like food that isn’t hearty or is vegetarian/vegan. Bavarians love their heavy food – meat, especially pork, and cheese are essential to the diet in Bavaria. If you love sausages or eating a whole pig (more or less), then Bavaria is your food heaven. While bigger cities, like Munich or Augsburg, make it easier for vegetarians/vegans or people who just want to eat healthily, it can be challenging to find easy and healthy options in other parts. It is not like we people in Northern Germany eat extremely healthy, but I felt like there was a big difference between the food in Northern and Southern Germany. So, if you are picky about your food, I suggest booking an Airbnb in the smaller villages, so you can cook your own food or just buy more snacks from the supermarket. Bring your reusable water bottle because in many parts of Bavaria, you can just refill your bottle with fresh mountain water from fountains (just shy away from it if it says “KEIN TRINKWASSER“). Credit and debit cards are accepted widely, but in smaller shops and villages, that might not be the case. You cannot pay at some ticket centers with your card, so always have cash on you (American Express is, unfortunately, not accepted while Visa and MasterCard are more common). At this point, I would like to thank the Bayerische Schlösserverwaltung for the work they do. They take extremely good care of the castles in Bavaria. The castles and the gardens in Bavaria are some of the most beautiful in the world, and as a visitor, you can visit the gardens for free. This is not standard in all countries and while visiting the inside of a castle is often a great experience, people on a budget or with little time (or with a dog) can enjoy the gardens without paying anything. So, even if you do not plan to visit the inside of a castle, add it to your itinerary because you will still be able to enjoy the rest of it for free. 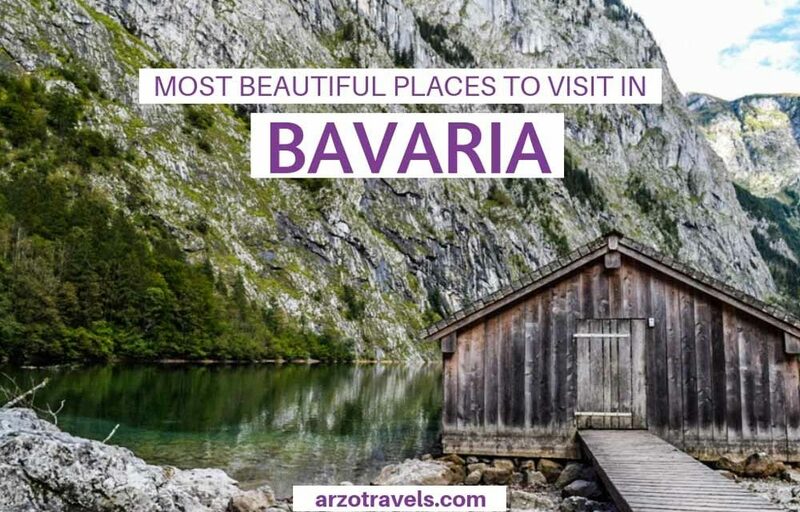 Okay, let´s get started about the most beautiful places in Bavaria – about the main attractions and top sights, the most beautiful cities in Bavaria and more. This place is probably the prettiest town in Germany. It is as picturesque as it looks in pictures and Rothenburg doesn’t disappoint. I got to visit twice and, admittedly, there are not that many places and attractions. If you are a fast traveler, you might be done in a few hours. But I still recommend staying in Rothenburg as least for a day. In summer, many tourists come here as a day trip, so try to come early in the morning or stay overnight. This way, you don’t have to fight your way through the crowds. It is a popular stop on the “Romantic Road“ – a popular road trip in Germany with the most romantic towns and castles along the way. Walk the town walls, and enjoy the cobblestone streets, pretty buildings, and great views. Enjoy a snack in the cutest cafe in Germany, too. Where to find that cafe? Click here for a detailed travel guide on the cutest town – Rothenburg. I suggest staying here a full day (though you could rush and see the top places in 3-4 hours). From Rothenburg ob der Tauber, you can visit Wurzburg and Dinkelsbühl quite easily. Click here to get the best rates for your stay in Rothenburg. Pretty lakes are only found in Switzerland and the Dolomites? Not really. Bavaria has a few very beautiful lakes that can keep up (well, almost) with them. Eibsee is one of them. For the best photo spots in Bavaria, visiting the Eibsee is a must. Eibsee is close to the town of Garmisch-Patenkirchen in the very south of Bavaria and lies at a height of almost 1,000 meters. If you like hikes but are worried about possible hikes that come with mountain lakes, don’t be. You can get here by car or public transportation. It takes just a few minutes to get to the lake. However, I really recommend walking around the lake because it shows its prettiest colors at the other end. It takes about 90-180 minutes (depending on your walking speed) to walk around the 8 km lake shoreline and see the lake from the best angles. If you are visiting Eibsee, you can combine it with a trip to Zugspitze (close to Garmisch-Partenkichen). I suggest planning in 2-5 hours for Eibsee (including some breaks). Another beautiful city, and probably the friendliest city I have ever come across in Germany, is Wurzburg (or Würzburg in German). But I actually don’t recommend visiting Wurzburg for its friendly people. The town is known for its baroque and rococo architecture, and wine lovers will also have some fun here. 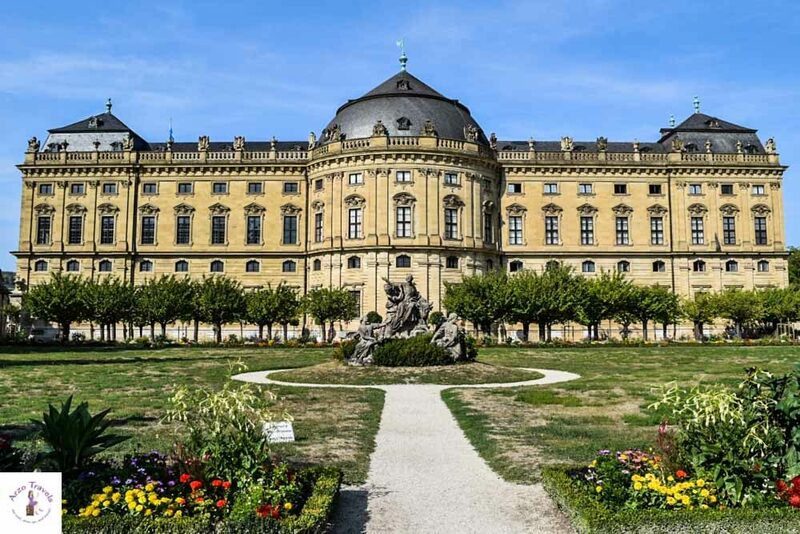 It is home to a gorgeous castle, the Würzburg Castle, and an interesting fortress, Marienberg Fortress. The old town and the Marienbrücke are more tourists sights in Bavaria. With a population of over 120,000, it is one of the bigger cities in Bavaria. If you are short on time, I suggest staying in Wurzburg for a day. The city is located in the northern part of Bavaria and is often the starting or ending point on the Romantic Road. I suggest planning in a full day for this pretty city. 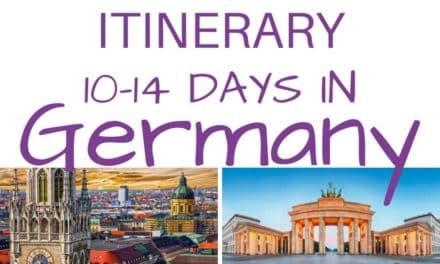 Read my 1-day Wurzburg itinerary. Yes, this is a princess´ dream come true, to visit Neuschwanstein Castle in the very south of Bavaria. While I had seen images of it, it took me forever to figure out where exactly to find it. The castle is probably the most famous attraction in Bavaria. The castle was built on a hill above the village of Hohenschwangau in the 19th century. The former king of Bavaria, Ludwig II, wanted to use it as a place for his retreats, so he paid for the building with his own money. Unfortunately for him, he did not get to see the finished version because he died shortly before its completion. While he couldn’t admire his own castle, about 1.3 million visitors do each year. Find all important travel information for Neuschwanstein Castle here. I suggest planning in 3-5 hours for this castle alone (but there is a lake and some more sights, like another castle) and a full day for this area. Surely, this is one of the best places to see in Bavaria, and actually, it is one of the best places to visit in all of Germany: Munich, the beautiful capital of Bavaria and the second biggest city in Germany. 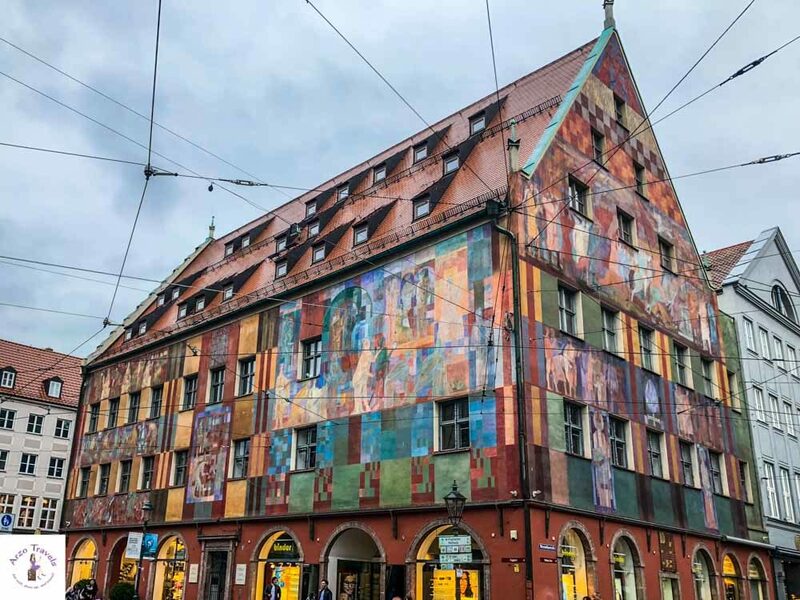 Located more towards the south of Bavaria, it is also a good base to use when heading to other tourist attractions in Bavaria, but the city itself is full of gorgeous places. 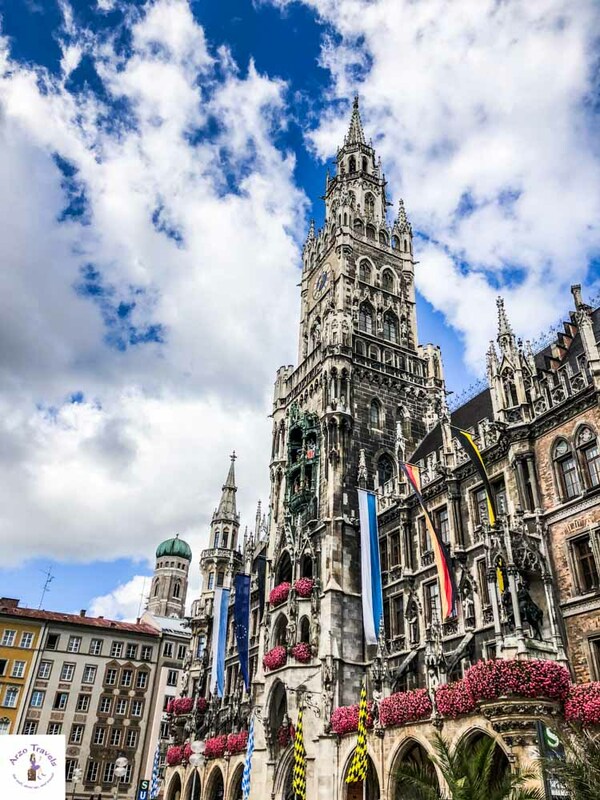 Fun things to do in Munich include: visiting the pretty market square (Marienplatz), the Munich Residence, the Town Hall, the Englischer Garten, the Viktualienmarkt, and the Asam Church. Of course, people love the Oktoberfest as well (can you believe the last time I was in Munich was at the time of the Oktoberfest, and I still skipped it?). Munich is a city full of sights, you spend days and weeks here without getting bored – if you have less time, you should plan in a full day for exploring Munich. Nuremberg is one of the bigger cities in Germany, and the second biggest city in Bavaria, with a pretty medieval old town. So, exploring the old town by foot is the best thing to do. Such pretty, old, and colorful houses make a perfect stop for any photographer (or Instagram addict). Also, visit the Kaiserburg (Imperial Castle) and look for the numerous statues and fountains throughout the city. Nurnberg is also known for having one of the best Christmas Markets. So, if you are in Bavaria at the end of November/ December and enjoy some mulled wine and gingerbread, Nurnberg is probably the best place for you to visit in Bavaria. Augsburg is another city to add to your Bavaria itinerary. It is the oldest city in Bavaria and the second oldest in Germany! With about 300,000 inhabitants, it is also the third biggest city in Bavaria, making it a lively and fun place to see. Medieval houses, a market square with an ancient town hall, the Fuggerei (the oldest social settlement in the world), and the fancy Maximilianstraße – there are quite a lot of attractions to visit. However, the most charming and off-the-beaten-path way to discover Augsburg is to stroll the canals and see the water mills. This also makes Augsburg unique, and it felt different than any other place in Bavaria. Stay 1 day in Augsburg and you will see the best places in the city. Near the Austrian border, you will find the clearest lake in Bavaria – the pretty Königssee. 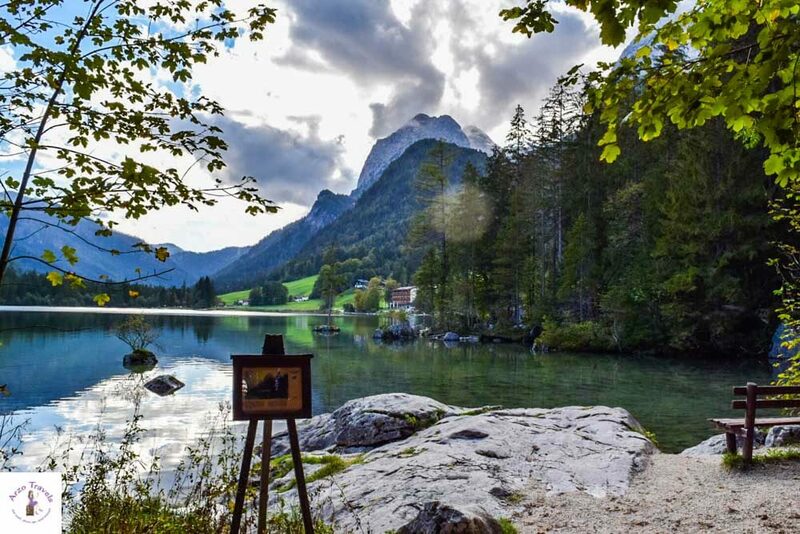 Most of the lake lies in the Berchtesgaden National Park, which makes it a protected area. While boats cruise the lake, the water is so clean that you could even drink out of it, thanks to those boats being electric. Add some hiking and a boat cruise to your Bavaria list. This way, you will see the St. Bartholomä, which is a popular pilgrimage church and, according to the boat captain, one of the most photographed buildings in the world (not sure about that though). 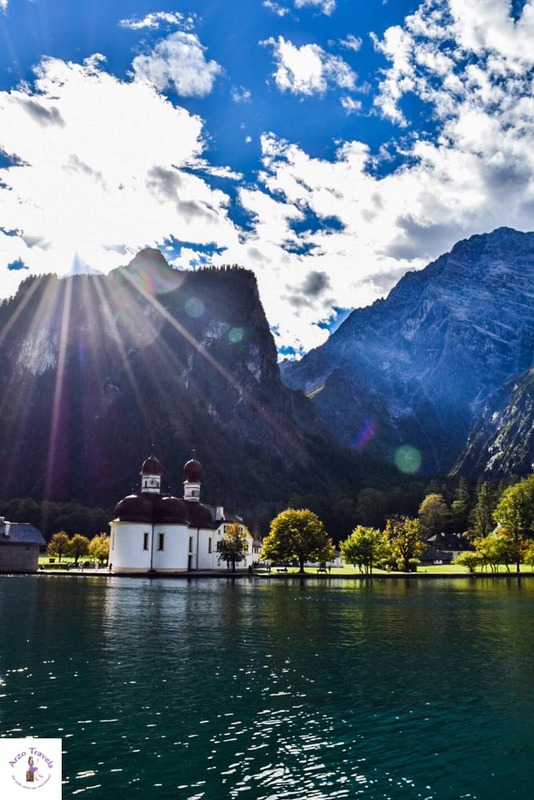 Obersee – which is just behind the Königssee – is reason enough to do the boat cruise. Get out at “Salet“ boat station and, after a ten-minute hike, you have the next treat for your eyes. If you do some hiking (around Obersee) and go on a boat cruise, I would suggest a full day at Königssee. 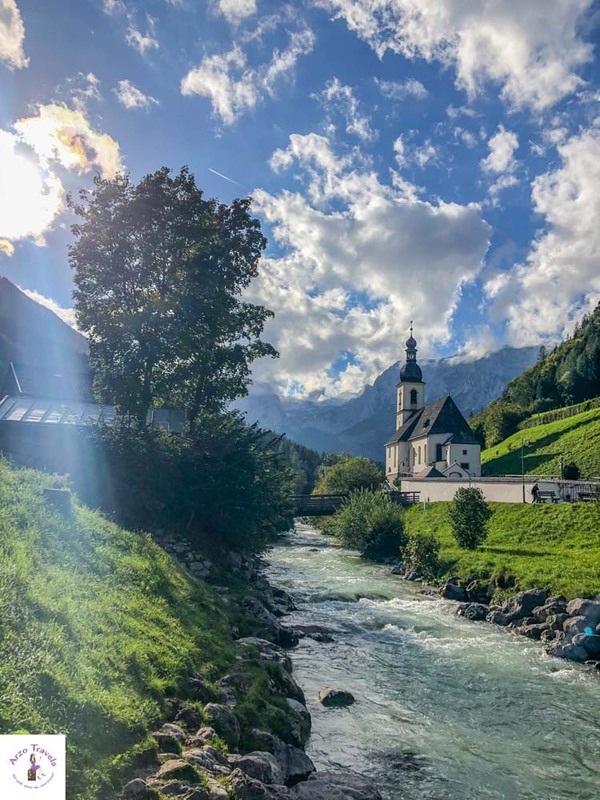 Here are the best hotels to stay near Königssee – my base was in Bad Reichenhall, which is great but so is Berchtesgaden. From these two places, you can get to some major Bavaria attractions quickly. 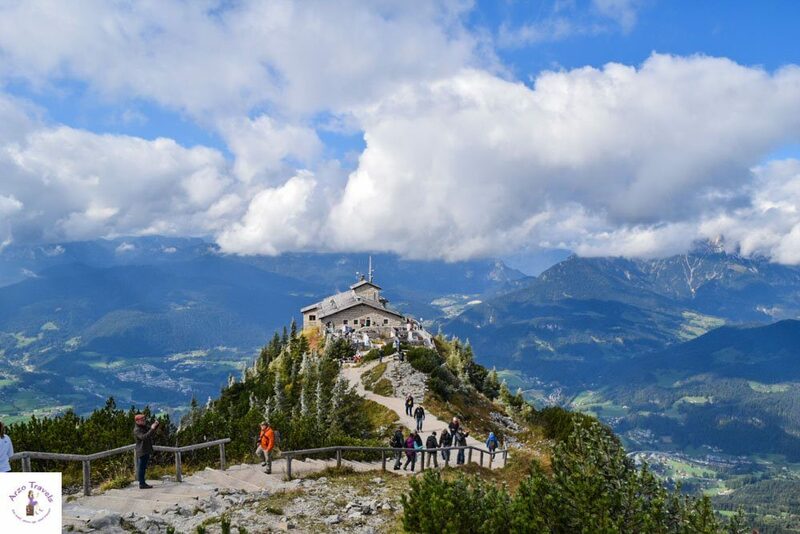 The Kehlsteinhaus, in the area of Berchtesgaden, is known for two reasons: its great views of the beautiful scenery and for being built during the NS dictatorship, where politicians of the NS regime later made decisions. According to the official website of Eagle´s Nest, it wasn’t a present for Hitler´s 50th birthday, though it often, and falsely, said to have been. After the initial idea of destroying the building after the Second World War, it was decided to leave it intact. Now, you can either hike up or take a special bus to get up and learn about its history – and, of course, enjoy the view. Unlike many other places I have mentioned here, Kehlsteinhaus is actually closed during winter time and only open from mid-May to mid-October. This Bavarian attraction is located near Berchtesgaden – it is also a popular day trip from Munich. If you hike up (and down), I suggest to plan in a full day. If you take the bus to get up and do some hiking at the peak, 3 to 7 hours should be enough. There are several gorges in Bavaria, but since I only got to visit one of them, I will just talk about that one. 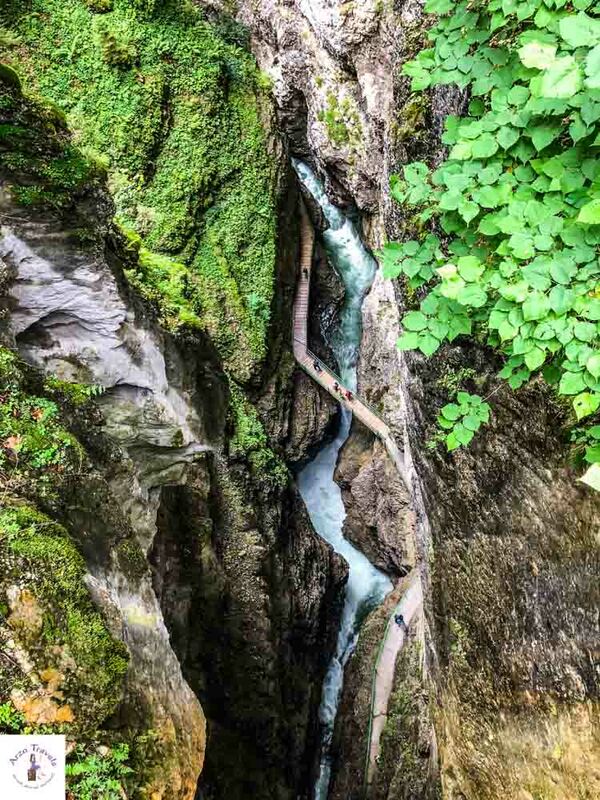 The Breitbachklamm is a gorge close to Garmisch-Patenkirchen. It was created by the Breitbach River and is one of the deepest gorges in the Bavarian Alps. For an entrance fee of about 5€, you can hike the gorge. Along the 2.5 km path, you will pass roaring waterfalls and fast currents. There are some steps and uphill hiking included, but with proper shoes, this is a nice walk – especially in summer, when it gets hot in the cities. Breitbachklamm is closed for almost two months in November and December, but the pictures during winter time always look amazing. It is great to visit from Garmisch-Partenkirchen and I spent about 2 to 3 hours here. Fancying a view from the highest mountain peak in Germany? The highest mountains are to be found in the Bavarian Alps, and the Zugspitze is Germany´s highest mountain. Spoiled by mountain views in Switzerland, I was not sure whether or not I should pay the 55€ to go up the Zugspitze. I ended up not going because for that amount of money, I wanted to have mountain views and I wasn’t really sure that the Zugspitze could actually deliver – on that day as it was a very cloudy day. However, even though I didn‘t end up going, if money didn’t play a role or if the day has been really clear, then the Zugspitze, at an elevation of almost 3,000 meters, would be a point of interest for many tourists. P.S. 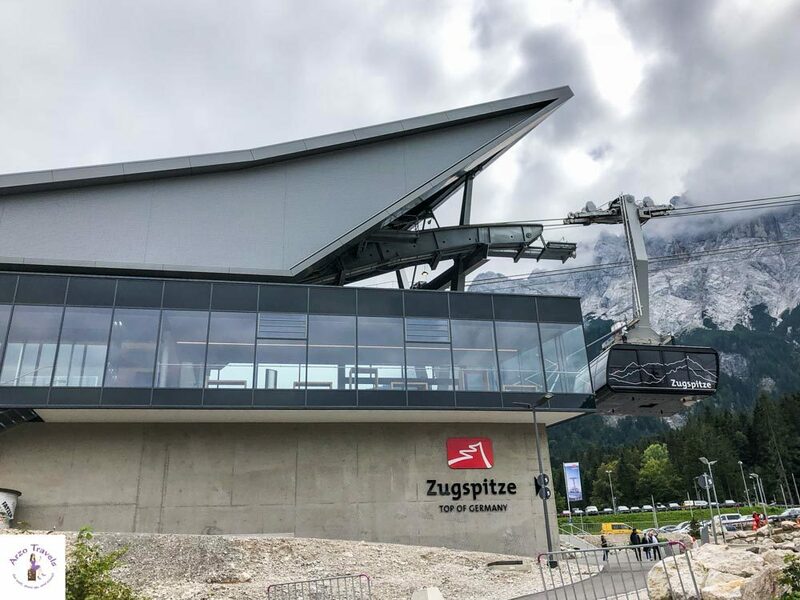 You might have heard about the damaged cable car, so while there is no cable car you can use, you can still use the funicular to get up Zugspitze. The Zugspitze is easily accessible from Garmisch-Partenkirchen and can be easily combined with a trip to Eibsee. This famous ski resort town in Bavaria consists of two parts: Garmisch and Partenkirchen, and is one of the most popular places to visit amongst tourists from all around the world. It is also a popular base if you want to visit the Zugspitze, the Eibsee, or Partnachklamm (another gorge), as the town centers themselves don’t have many attractions. 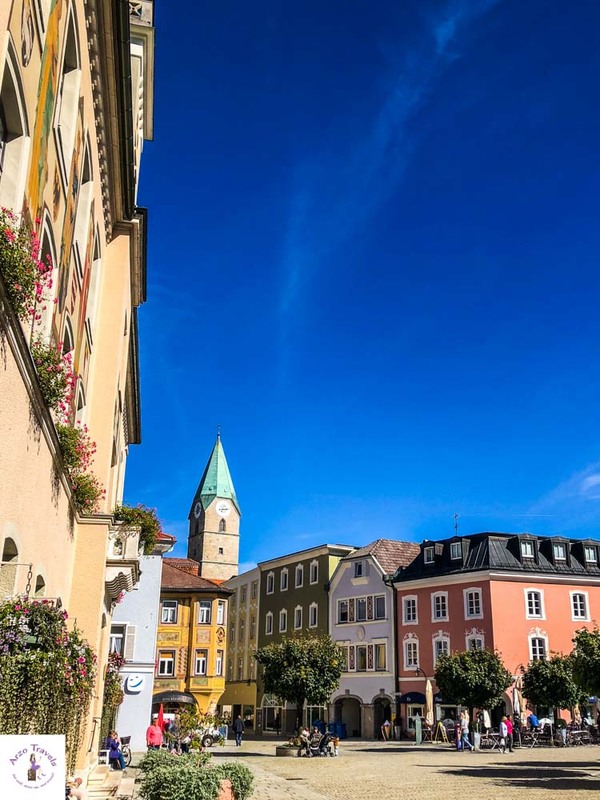 There are some pretty buildings and lots of flower pots around in the town center, and if you enjoy luxury shopping, then Garmisch-Partenkirchen is your place. 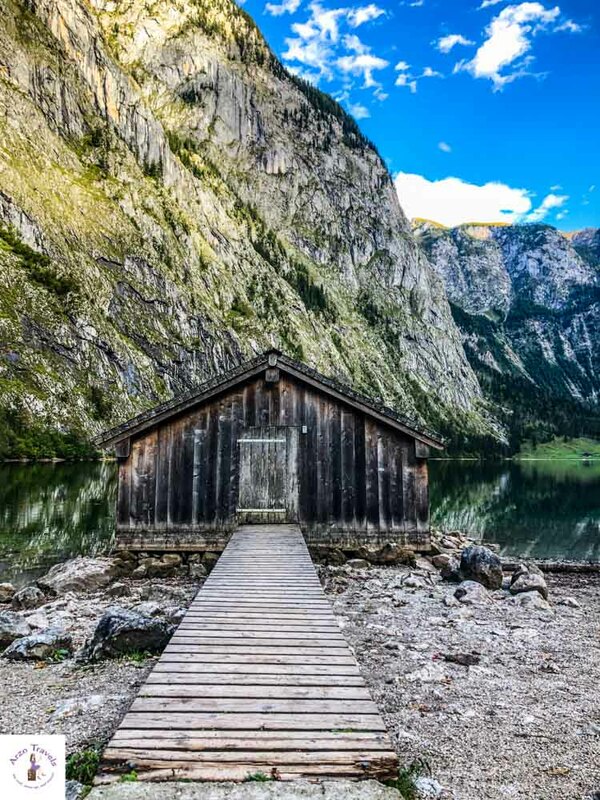 Also, in the region of Berchtesgaden, there is the beautiful Hintersee Lake – a mountain lake with great views of the mountain ranges and the Zauberwald forest. To enjoy the lake from all different angles, go on an easy 45-minute hike around the lake. On your way, you will find boards with info about different artists who were inspired by this lake. While I visited in early fall, this is probably also great to visit in winter and in summer. You can even rent a rowboat and have fun on the lake. The lake is located in a beautiful and quiet scenery. You can combine it with many different hikes – and in summer you can swim in the lakes and enjoy some water sports activities. So, you could spend between 1 to 8 hours here. A good base is Berchtesgaden or Bad Reichenhall. Okay, this might seem like a bit of a mouthful – Ramsau bee Berchtesgaden. But in my defense, I was really smitten when I passed this beautiful St. Sebastian Church, and the bridge that is just in front of the church – and the mountains in the background – seemed to be the icing on top of an already pretty place. It felt so idyllic and pretty, and it reminded me of how beautiful road tripping Bavaria can be. It is situated north of the Berchtesgaden National Park, and if you are in the area (Königssee or Hintersee), then this is a great stopover. I did not see much else to do, except strolling and taking pictures, so it is really not a place to spend hours. However, I was smitten. The historic town of Dinkelsbühl is the best preserved medieval town in all of Germany. Apparently, only one window glass was destroyed during World War II – nothing compared to many other German cities, towns, and villages. 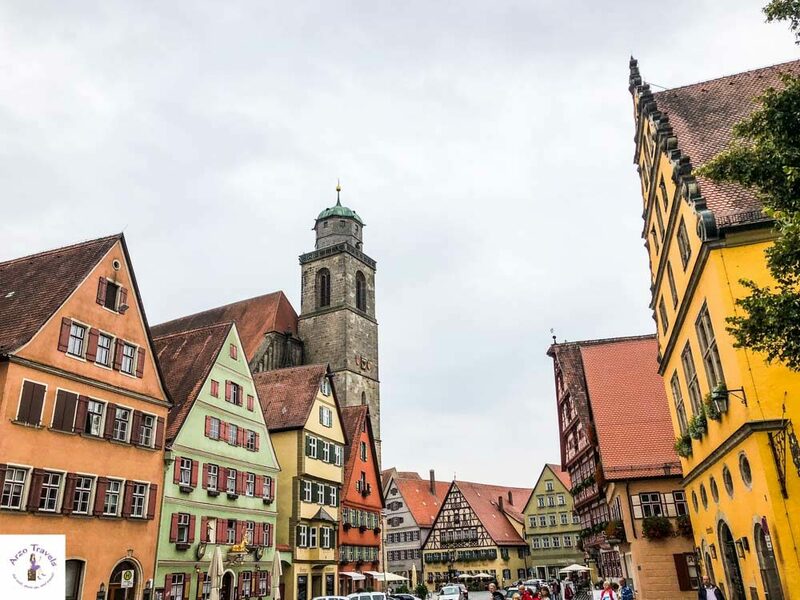 Colorful, semi-timbered houses and the Gothic Minster of St. George (one of southern Germany’s most impressive hall churches) are just some examples of its history. Strolling the old town is probably the best thing to do here. If you are a fast traveler, a few hours will be fine to discover the best of the best-preserved medieval town in Germany. Cute Bad Reichenhall! This place was base for my last five days and I had always wondered why the name was so familiar to me. Once I was there, I figured out that I sometimes buy my salt from “Bad Reichenhall“ and that was why the name was so familiar. Anyhow, this little Alpine town is really picturesque and a perfect place to relax and explore the area of Berchtesgaden. The town itself has several pretty gardens, like the Royal Spa Garden, and the small, but fine, town center with its market square. You can also find out a lot about the history of salt production in Bad Reichenhall. When I visited places in and around Berchtesgaden, Bad Reichenhall was actually my base. Staying here is not as handy as Berchtesgaden itself (and gosh, the tax per night with 3,20 € is really high) but I loved it and would probably stay here again if I don’t find a great hotel deal in Berchtesgaden itself. Linderhof Palace is another beautiful castle with a gorgeous garden in front of it. It is located close to Ettal Abbey. King Ludwig II of Bavaria, who also built Neuschwanstein Castle, actually got to see the end result of this one, the smallest of his three castles. Like Neuschwanstein Castle, you can go inside for an entrance fee, but strolling the garden is free. It is probably the nicest garden in Bavaria, even though there is a lot of construction work going on and the construction cranes spoil the idyll. You can go for longer hikes around the castle and enjoy lush mountain views. You can get here from Garmisch-Partenkirchen, Füssen or Munich. Another picture-perfect little town to see is Füssen (or Fussen), in the very south of Bavaria. 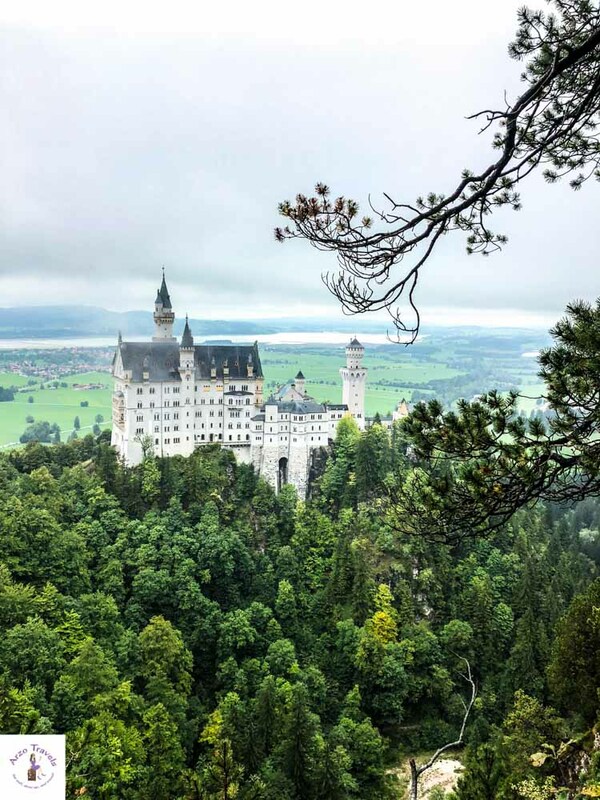 It is often overlooked, as it is at the end, or beginning, of the Romantic Road, and visitors head to Schloss Neuschwanstein and then home or to Munich. However, this pretty town has numerous historic and colorful buildings, like the Hohe Schloss, which used to be a summer residence for bishops and is now a museum, or the monastery Benediktinerklosters St. Mang. Also, stroll the river and enjoy the views from the Theresienbrücke and the Lech River. Want to find out more about Fussen? Here are more tips on what to do in Fussen. 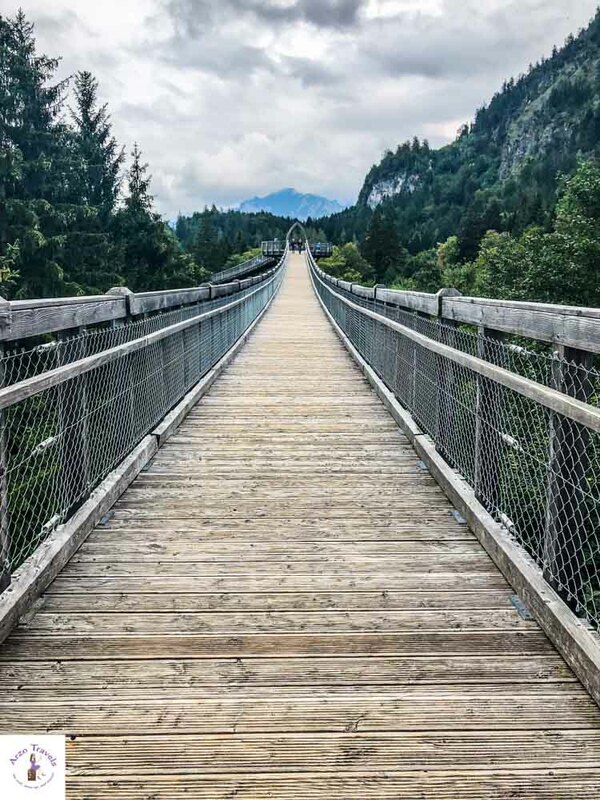 If you are into interesting bridges, head to the Walderlebniszentrum Füssen, where you can walk the 480-meter “Baumkronenweg“ for an entrance fee. 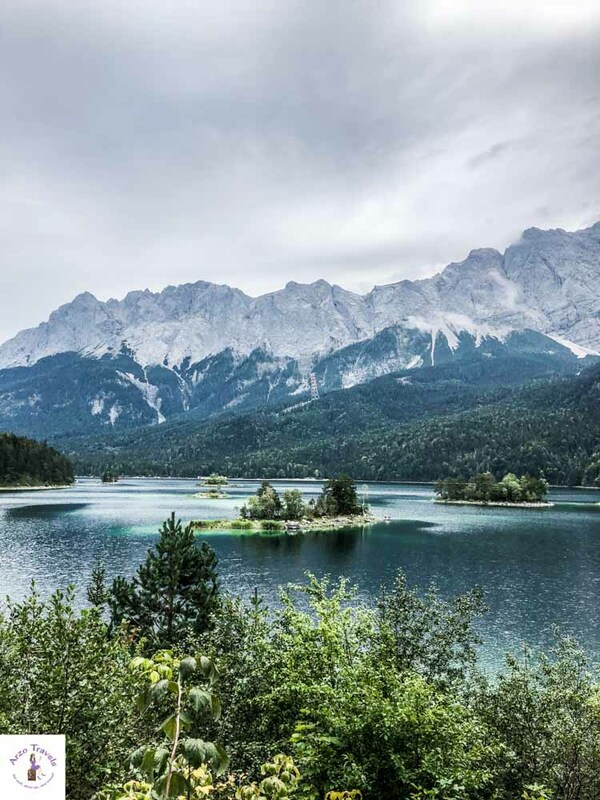 As you can see, Bavaria has a lot to offer – it surely is one of the prettiest states in Germany and should be on your Europe itinerary. 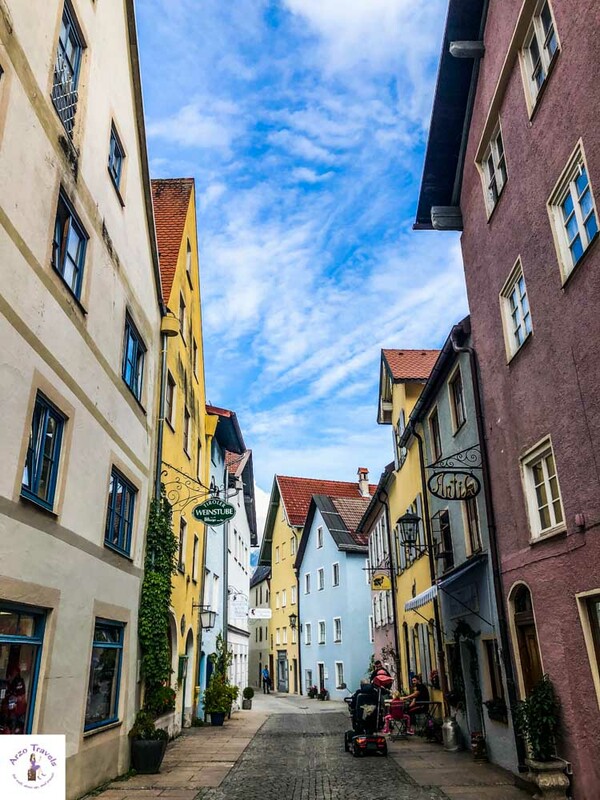 I hope this post has helped you get a good impression of the pretty state of Bavaria, and the travel tips help you create your own Bavaria itinerary.